Let’s say you need to understand thousands or even millions of rows of data, and you have a short time to do it in. The data may come from your team, in which case perhaps you’re already familiar with what it’s measuring and what the results are likely to be. Or it may come from another team, or maybe several teams at once, and be completely unfamiliar. Either way, the reason you’re looking at it is that you have a decision to make, and you want to be informed by the data before making it. Something probably hangs in the balance: a customer, a product, or a profit. How are you going to make sense of all that information efficiently so you can make a good decision? Data visualization is an important answer to that question. However, not all visualizations are actually that helpful. You may be all too familiar with lifeless bar graphs, or line graphs made with software defaults and couched in a slideshow presentation or lengthy document. They can be at best confusing, and at worst misleading. But the good ones are an absolute revelation. The best data visualizations are ones that expose something new about the underlying patterns and relationships contained within the data. Understanding those relationships — and being able to observe them — is key to good decision making. The Periodic Table is a classic testament to the potential of visualization to reveal hidden relationships in even small datasets. One look at the table, and chemists and middle school students alike grasp the way atoms arrange themselves in groups: alkali metals, noble gasses, halogens. If visualization done right can reveal so much in even a small dataset like this, imagine what it can reveal within terabytes or petabytes of information. It’s important to point out that not all data visualization is created equal. Just as we have paints and pencils and chalk and film to help us capture the world in different ways, with different emphases and for different purposes, there are multiple ways in which to depict the same dataset. Or, to put it another way, think of visualization as a new set of languages you can use to communicate. Just as French and Russian and Japanese are all ways of encoding ideas so that those ideas can be transported from one person’s mind to another, and decoded again — and just as certain languages are more conducive to certain ideas — so the various kinds of data visualization are a kind of bidirectional encoding that lets ideas and information be transported from the database into your brain. An important distinction lies between visualization for exploring and visualization for explaining. A third category, visual art, comprises images that encode data but cannot easily be decoded back to the original meaning by a viewer. This kind of visualization can be beautiful, but it is not helpful in making decisions. Visualization for exploring can be imprecise. It’s useful when you’re not exactly sure what the data has to tell you and you’re trying to get a sense of the relationships and patterns contained within it for the first time. It may take a while to figure out how to approach or clean the data, and which dimensions to include. Therefore, visualization for exploring is best done in such a way that it can be iterated quickly and experimented upon, so that you can find the signal within the noise. Software and automation are your friends here. Visualization for explaining is best when it is cleanest. Here, the ability to pare down the information to its simplest form — to strip away the noise entirely — will increase the efficiency with which a decision maker can understand it. This is the approach to take once you understand what the data is telling you, and you want to communicate that to someone else. This is the kind of visualization you should be finding in those presentations and sales reports. Visualization for explaining also includes infographics and other categories of hand-drawn or custom-made images. Automated tools can be used, but one size does not fit all. While data visualization is a powerful tool for helping you and others within your organization make better decisions, it’s important to remember that, in the meantime, your customers are trying to decide between you and your competitors. Many kinds of data visualization, from complex interactive or animated graphs to brightly-colored infographics, can help your customers explore and your customer service folks explain. That’s why all kinds of companies and organizations, from GE to Trulia to NASA, are beginning to invest significant resources in providing interactive visualizations to their customers and the public. This allows viewers to better understand the company’s business, and interact in a self-directed manner with the company’s expertise. As big data becomes bigger, and more companies deal with complex datasets with dozens of variables, data visualization will become even more important. So far, the tide of popularity has risen more quickly than the tide of visual literacy, and mediocre efforts abound, in presentations and on the web. But as visual literacy rises, thanks in no small part to impressive efforts in major media such as The New York Times and The Guardian, data visualization will increasingly become a language your customers and collaborators expect you to speak — and speak well. It’s well worth investing in a talented in-house designer, or a team of designers. Visualization for explaining works best when someone who understands not only the data itself, but also the principles of design and visual communication, tailors the graph or chart to the message. Whether it’s text or visuals, important translations require more than basic tools. To go back to the language analogy: Google Translate is a powerful and useful tool for giving you the general idea of what a foreign text says. But it’s not perfect, and it often lacks nuance. For getting the overall gist of things, it’s great. But I wouldn’t use it to send a letter to a foreign ambassador. 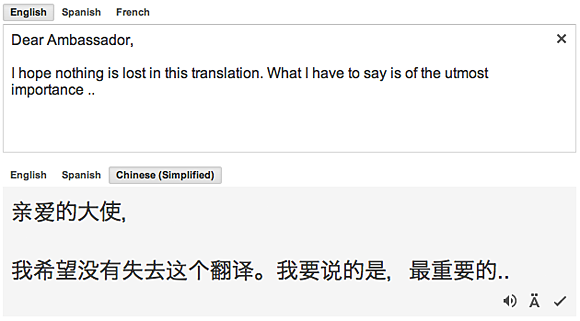 For something so sensitive, and where precision counts, it’s worth hiring an experienced human translator. Since data visualization is like a foreign language, in the same way, hire an experienced designer for important jobs where precision matters. If you’re making the kinds of decisions in which your customer, product, or profit hangs in the balance, you can’t afford to base those decisions on incomplete or misleading representations of the knowledge your company holds. Your designer is your translator, and one of the most important links you and your customers have to your data. Article image: (source: Getty Images). Julie Steele is Director of Communications at Silicon Valley Data Science. She thinks in metaphors and finds beauty in the clear communication of ideas. Julie is particularly drawn to visual media as a way to understand and transmit information, and is coauthor of Beautiful Visualization (O’Reilly, 2010) and Designing Data Visualizations (O’Reilly, 2012) in addition to multiple reports on the ways data science is being used across industries from health care to fashion.